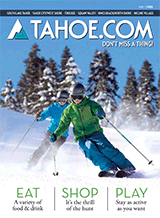 The Tahoe Truckee Earth Day Festival is a volunteer run, non-profit event to recognize, celebrate and promote the region’s unique beauty. Come to the Village at Squaw Valley on Saturday, April 21st from 11:00 am to 5:00 pm for fun, live music and entertainment, and learn how to preserve and protect our local and global natural resources. The Earth Day Festival provides a multitude of educational booths on the topics of watershed, health, forest health, pollution prevention, alternative energy, waste management, local art and more.